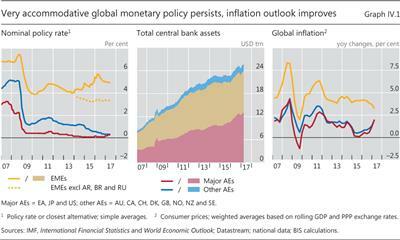 Monetary policy remained generally highly accommodative, with nominal and real interest rates kept very low and central bank balance sheets remaining large or growing further. Against the backdrop of strengthening growth, inflation developments took centre stage in central bank decisions. While inflation rates for the most part became better aligned with central bank price stability mandates, the significant reduction in labour market slack raised questions about upside inflation risks. 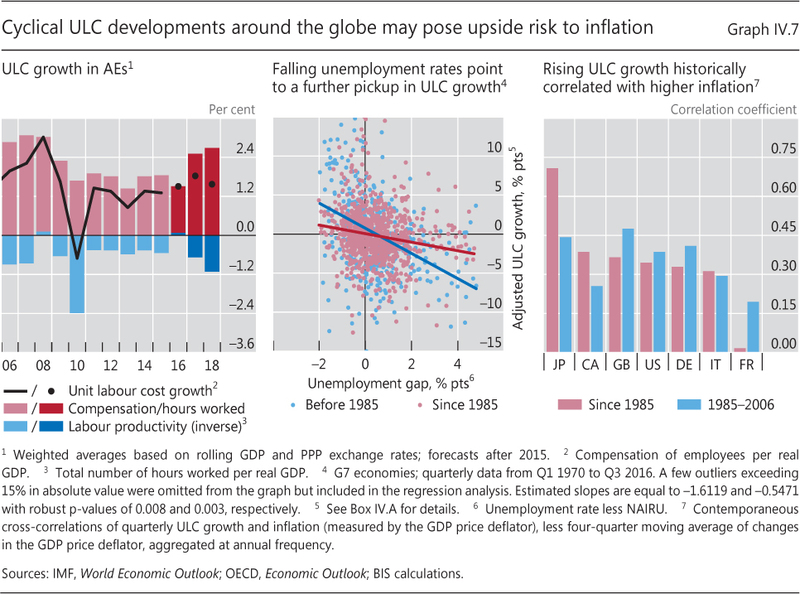 That said, an evaluation of those risks based on historical labour market developments suggests that they are unlikely to be the primary risk to the global expansion under way. Policy normalisation presents unprecedented challenges, given the current high debt levels and unusual uncertainty. A strategy of gradualism and transparency has clear benefits but is no panacea, as it may also encourage further risk-taking and slow down the build-up of policymakers' room for manoeuvre. Monetary policy continued to be generally very accommodative in the year under review. The Federal Reserve quickened its pace of policy rate normalisation while the Bank of Japan and ECB maintained their expansionary stances. Many other advanced economy and emerging market economy (EME) central banks kept policy rates range- bound near historical lows. Even so, the prospects for a gradual withdrawal of accommodation grew against the backdrop of a strengthening global recovery, firming global labour markets and maturing financial cycles. Monetary policy normalisation assumed greater prominence as the US policy rate edged further upwards and other central banks, notably the ECB, began to consider the issue more actively. The pace is generally expected to be even more gradual and predictable than in the past. But calibrating it is not without challenges. Normalising too slowly would raise the perennial concern of central banks that they will fall behind the curve and have to catch up in a disruptive fashion. Normalising too quickly would raise the risk of short-circuiting the recovery. Either way, policy normalisation in the major advanced economies will have far-reaching implications domestically and internationally. Compounding the challenge are the asynchronous nature of the normalisation across economies and high debt levels globally. 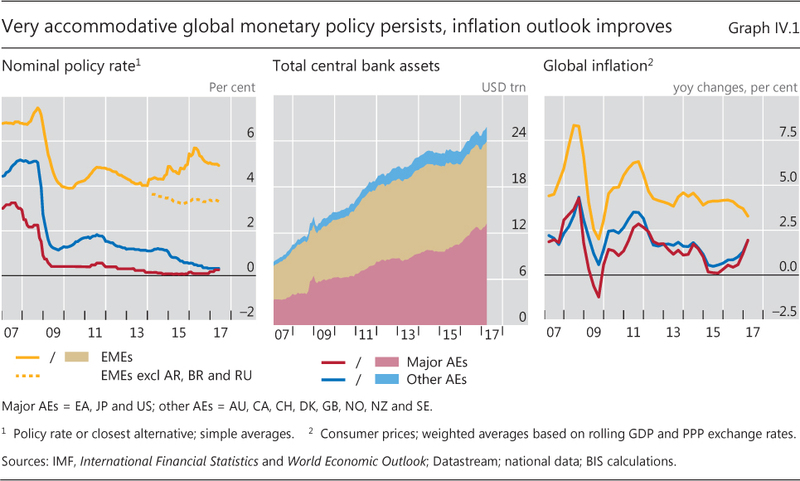 After reviewing monetary policy decisions over the past year, this chapter examines the evolving inflation outlook, with a special focus on global labour markets. It then discusses normalisation challenges, highlighting price and financial stability trade-offs and the policy options available to address them. Nearly a decade after the outbreak of the Great Financial Crisis (GFC), policy rates continued to sit near historical lows, with geopolitical events prompting some additional easing in mid-2016 (Graph IV.1, left-hand panel). While the total size of central bank balance sheets reached new heights (Graph IV.1, centre panel), the trajectories followed by individual central banks were quite diverse. 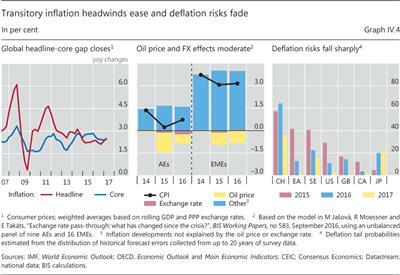 All this occurred as the global recovery gained traction, financial market conditions tightened somewhat, and inflation picked up in advanced economies while edging down on average in EMEs (Graph IV.1, right-hand panel). Monetary policy divergence among the major advanced economies widened during the year while real policy rates stayed at or near historical lows (Graph IV.2). In the United States, the withdrawal of monetary accommodation resumed after a year-long pause, with two 25-basis point increases in the federal funds rate target range. The increases reflected improved labour market conditions, greater optimism about the recovery's strength and confidence that inflation was moving back to its 2% target over the medium term. 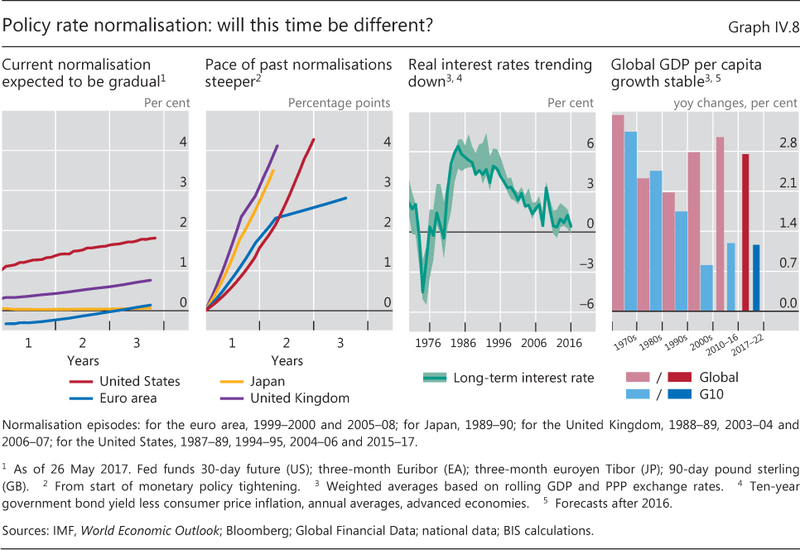 The Federal Reserve continued to anticipate a gradual policy rate normalisation over the next few years, along with a drawdown of its enlarged balance sheet once policy rate normalisation is "well under way". US policymakers also revised down the (median) projection for the long-run level of the federal funds rate to 3%, down after many revisions from 4.25% in 2012, reflecting views about a decline in the "natural" rate (see below). The ECB kept its key policy rates unchanged - with the main refinancing rate at 0% and the deposit facility rate at -0.4% - so as to sustain a very substantial degree of accommodation. The ECB cited subdued inflationary pressures and mixed economic and financial prospects as its key reasons for keeping rates low for long. It also announced an extension of its asset purchase programme through at least December 2017. However, with deflation risks receding and economic growth prospects improving, it ratcheted down the pace of asset purchases in April from €80 billion to €60 billion per month. The Bank of Japan modified its large-scale monetary easing programme, labelled QQE (quantitative and qualitative monetary easing), with yield curve control. The new features included targeting the 10-year Japanese government bond yield, currently set at about 0%, and a commitment to overshoot the inflation target for a while. The -0.1% rate on policy rate balances remained unchanged. The new approach addressed concerns that the prospect of higher global long-term yields could put unwelcome upward pressure on Japanese bond yields. The Bank of Japan coupled the approach with an expansion of its US dollar-supplying programme and purchases of exchange-traded funds. Central banks outside the major advanced economies faced a diverse set of challenges. Overall, policy rate moves were few. 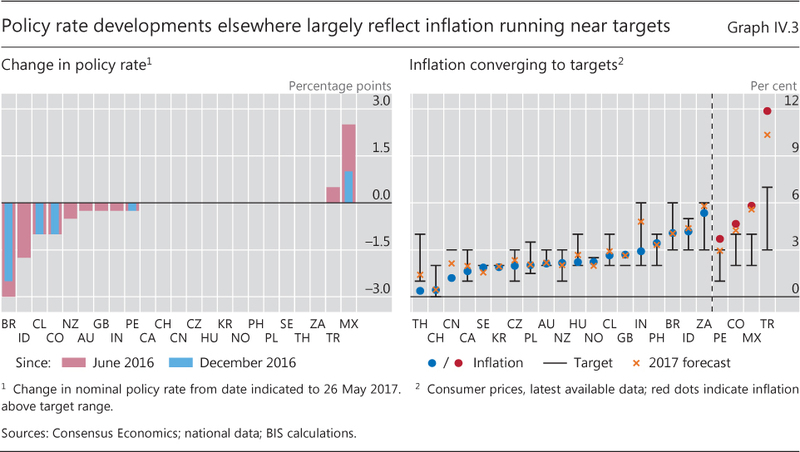 Inflation developments dominated decisions, as inflation generally became better aligned with targets. Many central banks held policy rates unchanged as they balanced competing risks (Graph IV.3, left-hand panel). On the one hand, the strengthening global recovery and, in particular, tightening labour markets in many economies suggested a need for higher rates in the near term. With respect to financial stability, high and growing credit-to-GDP ratios and housing prices continued to weigh on decisions in some economies. And inflation deviations from target shrank as the effects of past commodity price declines and exchange rate swings largely ran their course. On the other hand, a rise in geopolitical risks and uncertainties argued for patience or somewhat lower rates. While the People's Bank of China cited several of these factors as it kept the official benchmark deposit and lending rates unchanged, it did nudge up rates on its open market operations and medium-term liquidity facilities. The Czech National Bank, while leaving policy rates unchanged, discontinued its exchange rate floor in April as inflation turned upwards and gained momentum. For central banks that reduced rates, the cuts took place largely in response to inflation news. Brazil and Indonesia slashed rates by 3.0 and 1.75 percentage points, respectively, after significant declines in inflation towards target alongside a relatively stable exchange rate. 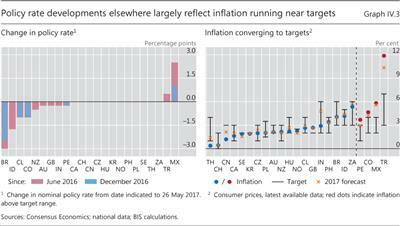 Colombia and Chile also experienced some relief from above-target inflation, which fell faster than expected as financial conditions tightened in late 2016. The Reserve Banks of Australia and New Zealand lowered policy rates to historical lows on subdued inflation, continued lacklustre growth and exchange rate concerns, despite long-standing financial stability risks. The Bank of England and Reserve Bank of India eased policy in response to significant domestic political decisions. In the aftermath of the UK referendum on EU membership, the Bank of England cut its policy rate by 25 basis points, the first move in over seven years. It cited potential adverse economic and financial effects from Brexit. At the same time, the bank introduced a new round of bond purchases, raising the size of its asset purchase programme from £375 billion to £435 billion. The Reserve Bank of India also lowered its policy rate by 25 basis points, although inflation remained comfortably within the target range. Demonetisation of large-denomination rupee bills raised the risk that economic activity might be affected. Central banks that raised rates did so in large part to address exchange rate developments. The Bank of Mexico and the Central Bank of the Republic of Turkey lifted rates as sharp currency depreciations increased the likelihood that inflation would run substantially above target, unanchoring expectations. One major theme during the year was the evolving inflation outlook. Inflation headwinds from past commodity price declines eased appreciably. Tighter labour markets showed signs of exerting upward pressure on wages and prices, raising questions about whether further tightening could lead to a stronger effect on inflation. Global inflation edged up to 2.5% (Graph IV.4, left-hand panel). Both near-term and cyclical inflation drivers played significant roles. Commodity prices ticked up. Exchange rates stabilised. Shrinking output gaps and generally tighter labour markets reflected the cumulative effect of the long-lived moderate global recovery. 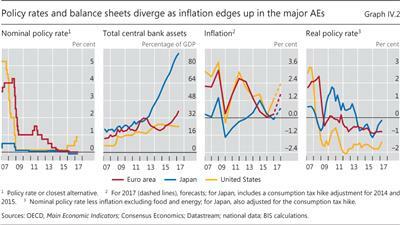 For many central banks, inflation objectives appeared increasingly within reach, as reflation pressures helped close the gap between actual and target inflation. Among the near-term, proximate inflation determinants, commodity prices supported a pickup. For example, the oil price headwinds of the previous two years eased significantly (Graph IV.4, centre panel). As a result, headline inflation drew closer to core inflation, and deflation risks fell (Graph IV.4, right-hand panel). Near-term inflation expectations also increased, notably those reflected in professional forecaster surveys in a number of economies. The smaller deviations of inflation from target also reflected continued improvements in cyclical demand. Measures of slack shrank further. While output slack estimates still suggest modest spare capacity in some economies, unemployment rates fell close to, if not below, rates previously deemed consistent with long-run price stability (Chapter III). 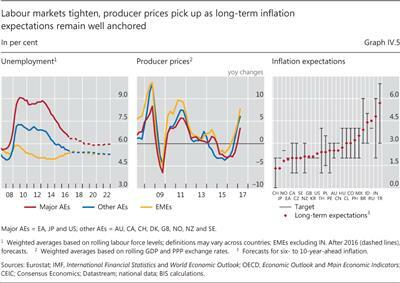 1 In addition, central banks and private forecasters expected additional tightening of labour markets (Graph IV.5, left-hand panel), pointing to possible further increases in underlying inflation ahead (see below). Reinforcing these developments, producer price inflation rose considerably (Graph IV.5, centre panel). In spite of the reflation, long-run inflation expectations remained well anchored. As in earlier years, survey-based measures ran well within most central banks' target ranges (Graph IV.5, right-hand panel). In addition, market-based measures of long-run inflation expectations recovered somewhat from lows in the previous year, suggesting that concerns about deflation risks have faded. As discussed in the 86th Annual Report, questions were raised about the reliability of these market measures, owing to significant time-varying liquidity and term premia as well as an undue sensitivity to short-term oil price fluctuations (Chapter II). Nevertheless, central banks took some comfort in seeing these measures turn upwards. Despite the moderate near-term and cyclical reflationary forces at work, secular factors, such as globalisation and technology, seemingly continued to work in the opposite direction. The 86th Annual Report raised the possibility that improvements in technology and expanding global value chains (GVCs) have held down price pressures in past decades. These supply side forces generate "good" disinflationary headwinds. 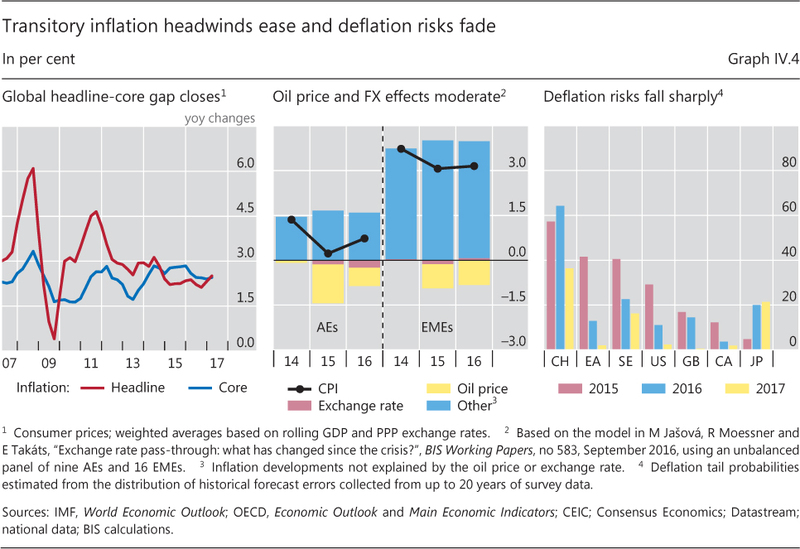 The levelling-off of globalisation in recent years, as documented in Chapter VI, has raised the question whether the headwinds have moderated, possibly contributing to the upward tilt in the inflation outlook. Are labour markets signalling rising inflationary pressures? 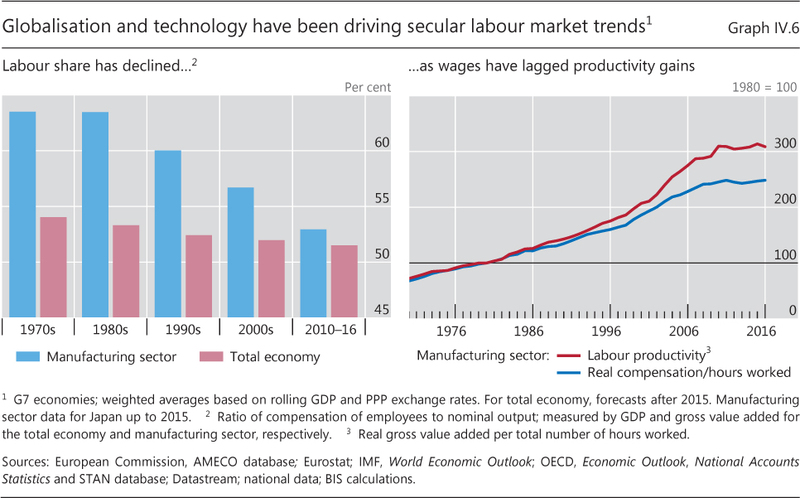 Global labour markets have seen profound changes over the past decades, with significant implications for wage and price formation. As labour market slack diminishes, wage growth is expected to rise. But wage demands have lagged the cycle more than in the past. Rather than a purely cyclical phenomenon, this wage behaviour appears to reflect long-term forces that are reshaping the global economy. The question for many central banks is whether these developments have so weakened the relationship between inflation and labour market slack that the recent tightening of labour markets poses little threat of an inflation overshoot. Subdued wage growth is a sign of labour's declining "pricing" power. While a number of factors have contributed to this development, two deserve special attention. One factor has been the dramatic expansion of the global labour force. In the 1990s and early 2000s, the opening-up of Asia and the former Soviet bloc roughly doubled the effective labour force involved in world trade. 1 More recently, further economic integration and increasing participation in GVCs have boosted international competition in labour markets. These profound changes in labour markets may also have far-reaching implications for inflation. One reason why labour markets have traditionally been regarded as key for inflation is that wage increases lead to rising production costs and hence higher prices, which may in turn reinforce wage demands - so-called second-round effects. After all, wage costs account for the bulk of production costs, especially in the service sector. The more workers can strengthen their pricing power, the more likely it is that wage demands will be accommodated. 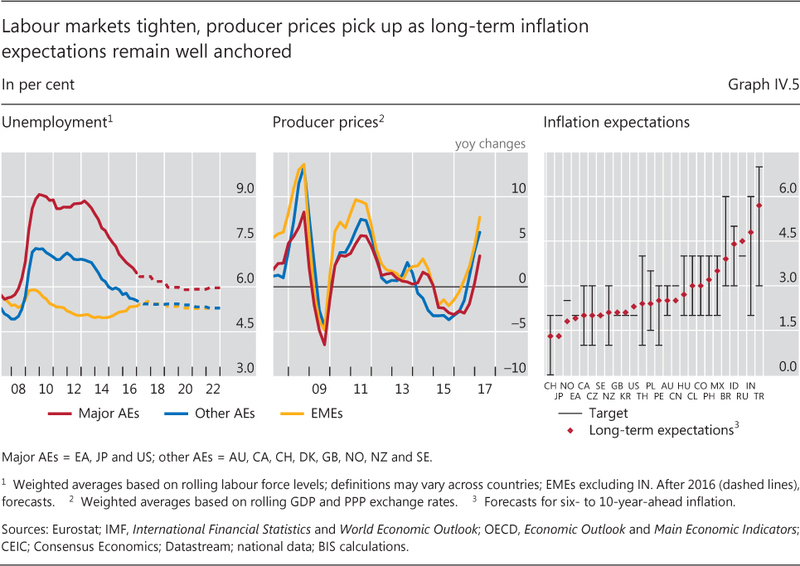 Thus, a secular decline in pricing power can shed light on the question of how far the recent tightening of global labour markets points to a build-up in inflation momentum. Analysing this question requires a number of links to be considered: the relationship between wage pressures and production costs, ie unit labour costs (ULCs); that between labour costs and measures of economic slack; and finally that between ULCs and inflation. The picture that emerges is a mixed one. Wage growth is not necessarily inflationary: whenever it is supported by productivity gains, it will not lead to rising production costs. 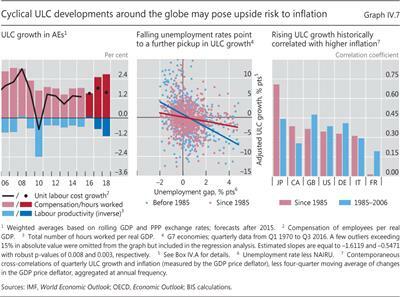 This is why ULC growth is a better, if still imperfect, measure of incipient inflationary pressures. At the current juncture, advanced economy ULCs are expected be held in check by somewhat faster productivity growth, despite stronger earnings growth (Graph IV.7, left-hand panel). There is also some evidence that the link between ULC growth and domestic labour market slack has weakened over the years (centre panel in Graph IV.7), but remains significant. The secular decline in labour's pricing power appears to have played a role (Box IV.A). 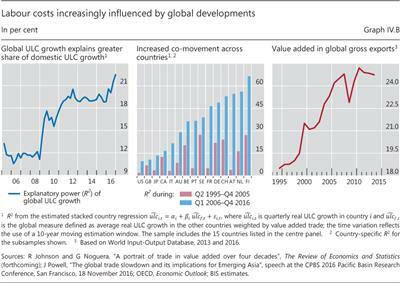 Other evidence points to the real economy's globalisation as a force behind this decline: a country's ULC growth has become more correlated with global ULC growth, weighted by the country's value added trade (Box IV.B). This also suggests that an exclusive focus on domestic developments could underestimate inflationary pressures, now that ULCs are rising globally. Other factors may have weakened the relationship between slack and wage growth only temporarily. Wage gains may have been unusually weak simply because of the depth of the recession and nominal wage rigidities. 8 With inflation having eroded real wage gains since then, wage pressure might revive if inflation continues to increase as slack diminishes. For instance, wage norms, which provide an orientation for such demands, fell to roughly 2% post-crisis, well below the 3-4% that was typical pre-crisis. 9 Indeed, early signs of such a return are visible in the more cyclically sensitive sectors, eg the rise in part-time wage growth. Ever since William Phillips published his seminal paper in 1958, a wide body of research has emphasised the role of economic slack in driving inflation in prices and wages. However, recent evidence suggests that the ability of price Phillips curves to explain inflation has declined (see Chapter III of the 84th Annual Report). What about the impact of economic slack on wages? For a G7 panel from 1960 to 2016, the relationship between ULC growth and slack (proxied by the unemployment gap (Graph IV.A, right-hand panel)) is found to be negative and statistically significant. The estimate of β indicates that a 1 percentage point decline in slack increases ULC growth by roughly 0.9 percentage points (red line, Graph IV.A, left-hand panel). 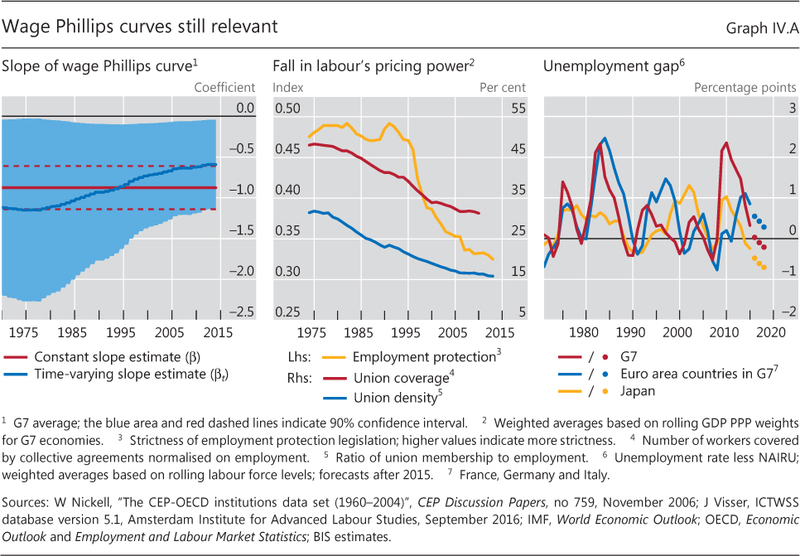 The estimated parameter γ is positive and significant, indicating that the lower pricing power has indeed reduced the sensitivity of ULCs to domestic labour slack - the average slope of the wage Phillips curve has become flatter across countries (blue line, Graph IV.A, left-hand panel). 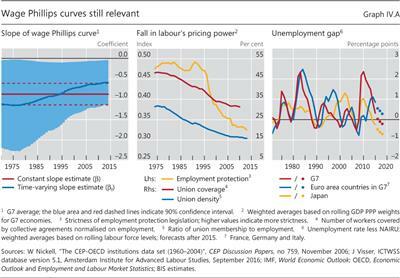 Even so, the time-varying Phillips curve slope has remained statistically significant, indicating that tighter labour markets continue to lift ULC growth, albeit by somewhat less than in the past. Taken at face value, the slope flattened from around 1.1 in 1974 to 0.6 in 2014. A Phillips, "The relationship between unemployment and the rate of change of money wages in the United Kingdom, 1861-1957", Economica, vol 25, no 100, November 1958. Each country's unemployment rate less its NAIRU (non-accelerating inflation rate of unemployment); in the panel regression, k is a constant, ci is a country fixed effect, ei,t is an error term and πi,t-1 is an inflation expectation proxy (measured by a four-quarter change in the GDP price deflator; see eg A Atkeson and L Ohanian, "Are Phillips curves useful for forecasting inflation? ", Federal Reserve Bank of Minneapolis Quarterly Review, Winter 2001). Start of the Great Unwinding? Policy normalisation has never been a question of "if" but rather of "when, how fast and to what level". These questions gained prominence in the past year, as the case for prolonged accommodation weakened and several central banks turned their attention to the process of normalisation. Currently, markets expect rates to rise very gradually (Graph IV.8, left-hand panel), as bloated central bank balance sheets are trimmed. Yet such expectations contrast sharply with past episodes of rising rates, which were typically much less gradual (Graph IV.8, second panel). In determining the pace of normalisation, central banks must indeed strike a delicate balance. On the one hand, there is a risk of acting too early and too rapidly. After a series of false dawns in the global economy, questions linger about the durability of this upswing. And the unprecedented period of ultra-low rates heightens uncertainty about reactions in financial markets and the economy. On the other hand, there is a risk of acting too late and too gradually. 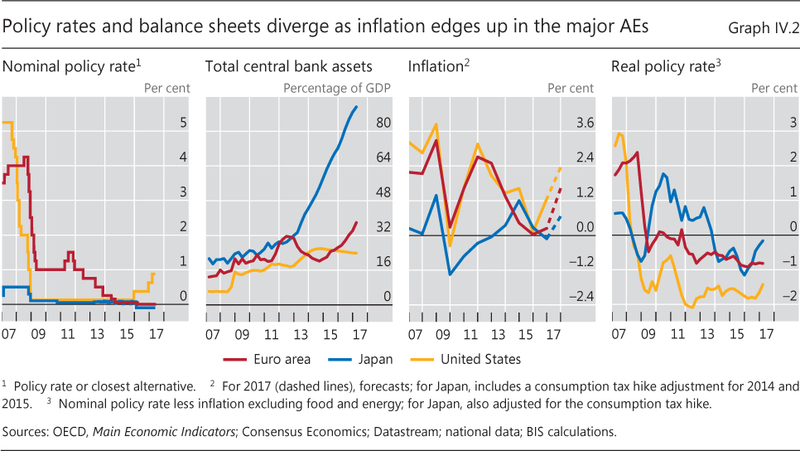 If central banks fall behind the curve, they may at some point need to tighten more abruptly and intensively to keep the economy from overheating and inflation from overshooting. And even if inflation does not rise, keeping interest rates too low for long could raise financial stability and macroeconomic risks further down the road, as debt continues to pile up and risk-taking in financial markets gathers steam. How policymakers address these trade-offs will be critical for the prospects of a sustainable expansion. Views about the end-point and initial economic conditions will naturally influence the shape and pace of the normalisation process. It is worth considering in more detail the issues that each of these aspects raises. A key question about the end-point is the level towards which the policy rate should be expected to gravitate. 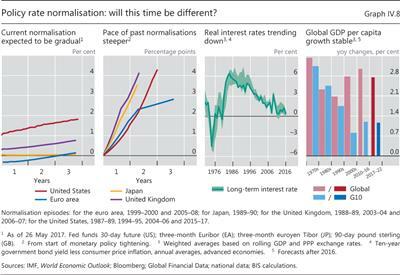 Central banks use a number of approaches to form a judgment about this, rather than simply extrapolating the decline in rates over time (Graph IV.8, third panel). One approach is to interpret what financial markets are pricing in, by deriving from bond yields what "markets think" the appropriate rate will be in the future (Chapter II). Another is to use modelling tools to estimate the end-point, defined as the "equilibrium" interest rate that balances the economy - sometimes also known as the "natural rate". 11 Both approaches would generally point to real (inflation-adjusted) short-term rates in the region of 0 to 2%. With the addition of target inflation of around 2%, this results in nominal rates of between 2 and 4%. 12 Alternative yardsticks, for example, based on the trend in global per capita growth to estimate the real rate, would suggest somewhat higher figures, of about 5% in nominal terms (Graph IV.8, right-hand panel). Labour cost developments have become increasingly synchronised across countries over the past two decades. 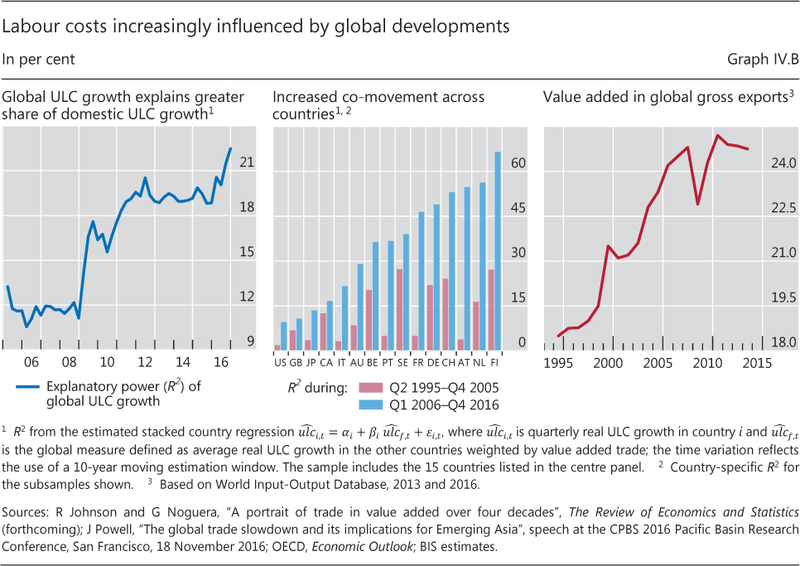 This general trend is reflected in the growing statistical power of global ULC growth in explaining domestic ULC growth - measured by the R2 in a rolling-window regression for 15 countries from Q2 1995 to Q4 2016 (Graph IV.B, left-hand panel). The R2 values are measured using a stacked country regression approach. From roughly 12% at the start of the sample, the R2 almost doubles to about 22% by the end of the sample period. The only pause in this trend occurred shortly after the GFC, which had varied effects on labour markets across the globe. The growing importance of global ULC growth can be inferred by looking at the country-specific R2 values for the two subsamples Q2 1995-Q4 2005 and Q1 2006-Q4 2016 (centre panel). The explanatory power of the statistical relationship has increased for all countries, quite substantially in some cases. The increasing global co-movement of ULCs is likely to have resulted from greater economic integration. Economic globalisation has fostered greater substitutability not only of intermediate and final goods and services but also of labour across countries. In particular, the rapid expansion of global value chains in past decades has resulted in greater competitiveness in price and wage setting across countries (right-hand panel). For labour, this has meant more exposure to global competition, directly through trade and indirectly through the threat that production might be shifted elsewhere within global supply chains. For an overview of the literature, see D Acemoğlu and D Autor, "Skills, tasks and technologies: implications for employment and earnings", Handbook of Labor Economics, Chapter 4 (Part B), Elsevier, November 2011. Unfortunately, none of these approaches is very reliable. Market prices can at best act as a sounding board, given the technical pitfalls in extracting information from them (Chapter II). Prices are strongly influenced by central banks, and the views of market participants embedded in them may well be wrong, as has often been the case in the past. In addition, since the equilibrium rate is unobservable, the outcome of model-based approaches hinges crucially on the assumptions made. Moreover, just as with estimates of economic slack, estimates of the natural rate are subject to significant revisions as time passes. Thus, it is not obvious how much guidance central banks can find in these highly uncertain estimates. The economic conditions at the start of the normalisation journey naturally encourage caution, as they will greatly heighten uncertainty about how financial markets and the economy will react. In particular, financial markets will need to adjust after an exceptionally long period of dependence on ultra-easy monetary conditions. And the global economy is threatened by a global debt overhang, as the ratio of debt to GDP has continued to rise post-crisis. Normalisation will test the economy's ability to tolerate higher rates: private sector expenditures may falter and fiscal positions prove more vulnerable than anticipated. Caution is normally interpreted to mean gradualism and transparency. Gradualism allows central banks to test the waters, seeking to avoid abrupt market adjustments and policy reversals. Transparency about the future policy path aims to remove one important source of uncertainty. Transparency may also go hand in hand with the gradual release of information about that path, in order to avoid sudden asset price adjustments, given the markets' tendency to telescope the future into today's prices. Thus, the combination of gradualism and transparency raises a dilemma. It can certainly dampen volatility in the short run. But, if pushed too far, it may raise the risk of a larger adjustment and unwinding in the longer run. Obvious examples include a snapback in bond yields (Chapter II) and broader debt- or inflation-related macroeconomic strains (Chapter III). More specifically, market dynamics may take on the attributes of a binary outcome, where the "risk-on" phases are punctuated by "risk-off" phases, rather than evolving smoothly. In the worst case, the central bank's choice may be between a sharper snapback after a longer lull and a smaller snapback after a shorter lull, rather than between a smooth and a turbulent exit. 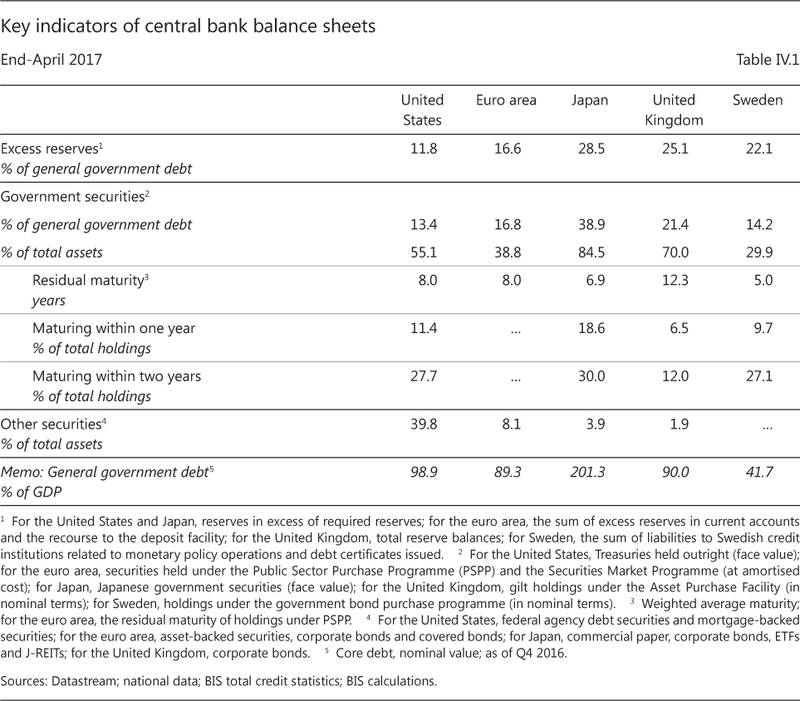 This dilemma is especially visible in the context of balance sheet policies - how central banks decide to normalise the size and composition of their balance sheets (Box IV.C and Table IV.1). 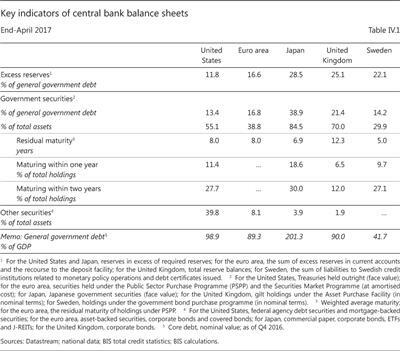 16 Central banks have generally communicated that they do not regard interest rate and balance sheet adjustments as equivalent. Interest rates are naturally seen as more agile, easier to calibrate and more predictable in terms of market and economic impact. So far, the emerging consensus seems to favour starting to normalise rates before trimming the balance sheet. Moreover, changes to the balance sheet could, in principle, be used as a complementary tool, altering the shape of the yield curve by influencing long-term yields through active sales: empirical evidence indicates that large-scale asset purchases had a considerable impact on long-term rates in the GFC's aftermath. 17 Indeed, central banks have not ruled out this possibility. But so far the central bank that has communicated most about the normalisation path, the Federal Reserve, has opted for a more passive, very gradual and predictable approach, reducing the balance sheet primarily by ceasing reinvestments at the rate regarded as appropriate. The 2013 taper tantrum, and the associated communication difficulties, are still very much on policymakers' minds. Normalising the balance sheet raises other challenges too. Some are technical and not new. For instance, because the central bank has no monopoly over the outstanding supply of government securities available to investors at various maturities, it cannot influence bond yields entirely on its own: what the government does also matters. Thus, the impact of a reduction in balance sheets will depend on how governments replace the maturing securities. Other, novel challenges have more of a political economy nature. Large central bank government bond purchases when rates are unusually low will entail losses precisely when the policy succeeds; that is, when the economy and inflation recover so that rates and yields rise again. The corresponding losses can lead to unwarranted public criticism and even threaten the central bank's autonomy. Similarly, large-scale central bank government bond purchases, financed mainly with excess reserves, amount to a sizeable quasi-debt management operation: they equate effectively to replacing long-term debt with very short-term claims, indexed to the overnight rate (Box IV.D and Table IV.1). This makes the government's fiscal position more sensitive to monetary policy tightening, possibly adding another source of pressure on the central bank if the amounts involved are very large. One way of limiting or avoiding both of these effects is to impose a non-remunerated reserve requirement to absorb excess reserves or to pay differential rates on those reserves. This would amount to a tax on the banking system, raising an additional set of issues. EMEs are likely to be the most exposed (Chapter III). Given the large increase in US dollar credit post-crisis, rising global interest rates and an appreciating US dollar raise foreign currency debt burdens and widen spreads. This tightening of financial conditions, together with volatility in financial markets, could have significant macroeconomic implications. 19 On the one hand, tighter financial conditions would depress economic activity. On the other hand, the depreciation of the domestic currency would put upward pressure on inflation, threatening second-round effects, especially in those economies with a poorer inflation record and more fragile fiscal positions. Central banks can seek to mitigate this dilemma by drawing on their foreign exchange reserves as well as by implementing macroprudential measures and possibly capital flow management tools. But there are clear limits to how far such a strategy can be pushed: it can help to smooth the adjustment but cannot solve the underlying problem. Central banks face several challenges in unwinding their balance sheets. This box complements the main text by considering two issues that can help shape the choice of unwinding strategies, ie the end-point, in particular the balance sheet's target size and composition, and views about the impact of balance sheet adjustments on financial conditions. Pre-GFC, the size of central banks' balance sheets was determined mainly by two factors: on the asset side, any desired foreign exchange reserve holdings; on the liability side, the amount of cash demanded by the public, and bank reserve balances, which were treated as autonomous factors to be passively accommodated. Absent large foreign exchange reserve holdings, this meant a rather small balance sheet, given that demand for cash was limited and control over the policy rate did not require large holdings of bank reserve balances. Indeed, where the central bank did not rely on reserve requirements, as in Canada, holdings were negligible. The economics of central bank balance sheet size have not fundamentally changed post-crisis. True, there may be reasons for central banks to operate with larger balance sheets than before. The authorities may wish to broaden access beyond banks or continue to set interest rates through a floor system (via the rate on deposit facilities for excess reserve balances) rather than through a corridor system. They may also want to augment the supply of liquid assets for banks. But none of these considerations requires a significantly larger balance sheet. For example, a floor system can be operated with a small amount of excess reserves, and short-term government paper can substitute closely for bank reserves as a safe liquid asset. Because larger balance sheets raise challenges (eg of a political economy nature) and constrain future room for manoeuvre, it is not surprising that central banks are considering how to trim them to a more "normal" size, with due regard for country-specific features and as circumstances allow. On the asset side, the desired balance sheet composition largely reflects structural factors and philosophical perspectives. Foreign exchange reserves are more important for non-reserve currency countries, especially small open advanced economies and EMEs. Another key issue is the distinction between private and public sector claims. In some countries, such as the United States or the United Kingdom, there has been a long-standing tradition of holding claims on the public sector only; in others, such as some European economies, it has been more common to hold private sector claims. This reflects a difference in the respective central banks' predominant concerns, about influencing the allocation of credit within the private sector on the one hand, and with being perceived to finance the government on the other. Within the euro area, an important additional concern is that of inadvertently generating transfers between member countries, which should be quintessentially a fiscal decision. Empirical evidence confirms the widely held view that large-scale asset purchases have significantly influenced yields and financial conditions. At the same time, it remains less clear through which channels they have worked, and this question can affect choices about unwinding strategies. A first distinction is between the impact of asset purchases as such, on the one hand, and of the information they convey about the future policy interest rate path (the "signalling channel"), on the other. The former operates mainly through term premia, the latter through the expected path of short-term rates (see also Box II.A). The existence of a significant signalling channel complicates communication and tends to favour more passive unwinding strategies, communicated in advance and in principle unresponsive to economic conditions. By adopting such a strategy, the central bank would effectively put the unwinding on "autopilot", preannouncing a given size-reduction path. The pace could involve, for instance, a predetermined schedule for phasing out reinvestments and for allowing securities to run off as they mature. This would limit any signalling effect to the time of the announcement, so that the central bank could thereafter signal its stance exclusively through changes in the policy rate. But clearer communication comes at the expense of less flexibility in responding to changing economic conditions - a price the central bank may be prepared to pay, especially if the effects of a more active strategy are perceived as unpredictable (see main text). At the cost of diluting the autopilot element, the strategy could be complemented with escape clauses in order to avoid excessive rigidity and strengthen credibility. The Federal Reserve, for instance, appears to have chosen to proceed this way. A second distinction is between stock and flow effects. The prevailing view among economists is that stocks matter most for asset prices: at any given time, investors must be content with the portfolios they have, otherwise prices will adjust. In particular, the duration of the central bank's holdings is especially important for term premia. Similarly, the relative scarcity of specific securities may incentivise investors to purchase assets with greater duration and credit risk. At the same time, it is also possible that flows matter - a view that has some currency among market participants. In this case, the balance between actual purchases and sales in any given period becomes critical. Concerns with flow effects would induce central banks to pay more attention to smoothing out actual transactions and would strengthen the case for gradualism. Order imbalances could become more important as, on average, 24% of total central bank holdings of government securities are set to mature in the next two years (Table IV.1). This puts a premium on avoiding cliff effects linked to lumpiness in the portfolio's maturity profile. Similarly, the relationship with the Treasury's issuing schedule would also matter more. And since stocks are much less volatile than flows, if the central bank wished to avoid large adjustments in yields it would tend to prefer a more gradual unwinding pace (eg phasing out reinvestments as opposed to stopping them abruptly). A third distinction is between the impact of announcements and actual transactions. Even in a pure stock view, is it the actual stock at any given point in time or the market expectations thereof that matters? Arguably, both play a role. That said, both casual and formal evidence indicate that announcements are quite important. For example, when central banks were easing policy, it was not uncommon for them to surprise markets, doing more than expected, thereby having a bigger impact on yields. To the extent that a central bank opts for more passive strategies during the unwinding phase, it may be important to update markets regularly about the evolution in its thinking about a chosen strategy and the implications of incoming data; this would ensure that markets are well prepared by the time of implementation and mitigate the risks of sharp price adjustments. The composition of the assets held in the portfolio adds another set of considerations. One dimension concerns the maturity structure. The longer the maturity, the longer the period needed for the unwinding. The average residual maturity of central banks' holdings of government securities varies widely, ranging from five years in Sweden to 12 years in the United Kingdom (Table IV.1). Another dimension is the distinction between private and public sector claims. In the case of the Federal Reserve, for instance, it currently holds around $1.5 trillion of mortgage-backed securities that will mature between 2040 and 2048. Historically, claims on the private sector have only made up a small fraction of the Federal Reserve's balance sheet. In the case of the Eurosystem, market liquidity issues in some national sovereign and corporate markets could be especially important, given the large share of central bank holdings. See eg U Bindseil, "Evaluating monetary policy operating frameworks", in proceedings of the Federal Reserve Bank of Kansas City Jackson Hole symposium, August 2016. Surveys on the effects of unconventional policies include C Borio and A Zabai, "Unconventional monetary policies: a re-appraisal", in R Lastra and P Conti-Brown (eds), Research Handbook on Central Banking, Edward Elgar Publishing, 2017; and S Bhattarai and C Neely, "A survey of the empirical literature on US unconventional monetary policy", Federal Reserve Bank of St Louis Working Paper, no 2016-021A, October 2016. See eg R Greenwood and D Vayanos, "Bond supply and excess bond returns", The Review of Financial Studies, vol 27, no 3, 2014; and B Sack, "The SOMA portfolio at $2.654 trillion", Federal Reserve Bank of New York, remarks before the Money Marketeers of New York University, New York City, 20 July 2011. See eg discussion on the portfolio rebalancing channel in B Bernanke, "The economic outlook and monetary policy", in proceedings of the Federal Reserve Bank of Kansas City Jackson Hole symposium, August 2010. While much attention has focused on the impact on bond yields of changes in central banks' large-scale government bond purchases, the effect on a government's financing costs has gone largely unremarked. And yet, if those changes are large enough, the impact can be sizeable. And this could have significant macroeconomic implications especially in economies with a high government debt-to-GDP ratio. The main reason is simple. From a consolidated public sector balance sheet perspective (ie one that nets out assets and liabilities between the central bank and government), large-scale purchases amount to a withdrawal of duration from the market: it is as if the government replaces long-term debt - the amount purchased by the central bank - with very short-term debt - the liabilities the central bank issues to finance the purchases. Since these liabilities typically take the form of excess reserves held by banks, they are equivalent to overnight-indexed debt. This makes the government's net borrowing costs more sensitive to higher rates. How large can this effect be? A back-of-the-envelope calculation can help put this in context. Assume, for simplicity, that at the time of a policy rate increase all government bonds held by the central bank have a residual maturity of at least two years (ie none of the securities mature within that period) and that the central bank does not purchase any new securities. Assume further that those bonds were issued at a fixed interest rate. This means that an increase in the cost of remunerating excess reserves (which moves with the policy rate) will not be matched by any increase in interest on central bank bond holdings. If the excess reserves in this calculation are, say, 10% of total government debt outstanding, each 1% increase in rates would raise interest payments by 0.1% of the debt stock. The impact can be particularly significant when excess reserves and government debt are large. For instance, if central bank excess reserves are 50% of outstanding government debt, a 200 basis point rate rise would amount to 1% of government debt. If interest payments on government debt are, on average, 2%, this would be equivalent to a 50% increase in debt financing costs. And if the debt-to-GDP ratio were 100%, this would translate one-to-one into percentage points of GDP. How indicative is this example? A number of factors need to be considered. First, central banks purchase government debt all the time in order to finance normal balance sheet growth arising from increases in reserve requirements and cash demand from the public. The back-of-the-envelope calculations above apply only to the change in central bank purchases specifically implemented to influence financial conditions. Second, the higher funding cost is transitory. Assuming a given balance sheet size, the central bank will need to reinvest the proceeds of any maturing bonds, and will do so at higher interest rates (across all maturities). Thus, over time, as the initial stock of bonds rolls over, the higher interest earned on the new bonds will offset the higher funding cost. In addition, the bond purchases would shorten the average maturity of the outstanding debt held by the public and hence would reduce the overall interest cost to the government over the long run as long as the yield curve is upwards-sloping. Third, the rules for central bank profit transfers and accounting conventions can make it difficult to track the size of the impact. Finally, the central bank could decide to offset some of the additional costs by lowering the average remuneration on required reserves, by either expanding unremunerated required reserves or applying differential rates on excess balances (eg a zero rate on a portion of excess balances). Table IV.1 provides a sense of the relative sensitivity of government financing costs to rate increases for a range of central banks that have engaged in large-scale asset purchase programmes. Based on general government debt as a percentage of GDP alone, the impact is likely to be largest in Japan and smallest in Sweden. Based on excess reserves as a percentage of government debt, the impact would be smallest in the United States and largest in Japan. The United Kingdom, the euro area and Sweden fall somewhere in between. Based on today's average maturity of government securities on central bank balance sheets, the transitional effect would be larger and longer-lasting in the United Kingdom and smaller and shorter in Sweden, and somewhere between in the other countries. See eg C Borio and P Disyatat, "Unconventional monetary policies: an appraisal", The Manchester School, vol 78, no 1, September 2010; J Chadha, P Turner and F Zampolli, "The ties that bind: monetary policy and government debt management", Oxford Review of Economic Policy, vol 29, December 2013. Central banks can also influence financing conditions by swapping bonds of different maturities in their portfolio without issuing central bank securities or reserves, as the Federal Reserve did during Operation Twist in late 2011 and 2012. Alternatively, assume that the central bank does not reinvest the proceeds from the maturing bonds or attempt to prevent the automatic shortening of its bond portfolio's average maturity. 1 See R Freeman, "Labor economics", Palgrave Encyclopaedia of Economics, 2005. 2 See L Karabarbounis and B Neiman, "The global decline of the labor share", Quarterly Journal of Economics, vol 129, no 1, 2014. 3 On the differential impact of automation on the wages of the skilled and unskilled, see eg M Elsby, B Hobijn and A Sahin, "The decline of the US labor share", Brookings Papers on Economic Activity, Fall 2013; and OECD, "The labour share in G20 economies", February 2015. On the possible role of the ascendancy of "winner takes all" firms in influencing the labour share, see D Autor, D Dorn, L Katz, C Patterson and J Van Reenen, "The fall of the labor share and the rise of superstar firms", NBER Working Papers, no 23396, May 2017. For a fuller assessment of potential factors at work, from institutional to measurement issues, see eg IMF, World Economic Outlook, April 2017. 4 See D Staiger, J Stock and M Watson, "Prices, wages and the US NAIRU in the 1990s", in A Krueger and R Solow (eds), The roaring 90s: can full employment be sustained?, Russell Sage and Century Fund, 2001. 5 See a review by R Bidder, "Are wages useful in forecasting price inflation? ", Economic Letter, Federal Reserve Bank of San Francisco, no 33, 2015. 6 See J Stock and M Watson, "Phillips curve inflation forecasts", in Understanding inflation and the implications for monetary policy: a Phillips curve retrospective, Federal Reserve Bank of Boston, 2009. 7 See eg S Aaronson, T Cajner, B Fallick, F Galbis-Reig, C Smith and W Wascher, "Labor force participation: recent developments and future prospects", Brookings Panel on Economic Activity, September 2014; and US Council of Economic Advisers, "The labor force participation rate since 2007: causes and policy implications", July 2014. 8 See eg M Daly and B Hobijn, "Downward nominal wage rigidities bend the Phillips curve", Journal of Money, Credit and Banking, vol 46, no 2, 2014. 9 See D Blanchflower and S Machin, "The current 2% UK wage growth norm", CEP Real Wage Update, March 2016. 10 See R Auer, C Borio and A Filardo, "The globalisation of inflation: the growing importance of global value chains", BIS Working Papers, no 602, January 2017. 11 See Chapter IV of the 86th Annual Report for a more detailed discussion of natural rate measurement. 12 Natural rate estimates are methodology-dependent. For international evidence, see eg K Holston, T Laubach and J Williams, "Measuring the natural rate of interest: international trends and determinants", Journal of International Economics, forthcoming; and J Hamilton, E Harris, J Hatzius and K West, "The equilibrium real funds rate: past, present, and future", Hutchins Center on Fiscal & Monetary Policy Working Papers, no 16, October 2015. For a range of estimates in the United States, see C Borio, P Disyatat, M Drehmann and M Juselius, "Monetary policy, the financial cycle and ultra-low interest rates", BIS Working Papers, no 569, July 2016. Estimation uncertainty has been emphasised eg by B Johannsen and E Mertens, "The expected real interest rate in the long run: time series evidence with the effective lower bound", FEDS Notes, Board of Governors of the Federal Reserve System, February 2016; and J Hamilton et al, op cit. 13 For additional details, see related discussion in the 86th Annual Report. 14 This is one aspect of the risk-taking channel of monetary policy. See C Borio and H Zhu, "Capital regulation, risk-taking and monetary policy: a missing link in the transmission mechanism? ", Journal of Financial Stability, 2012 (also published as BIS Working Papers, no 268, December 2008); and H S Shin and T Adrian, "Financial intermediaries, financial stability and monetary policy", in Maintaining stability in a changing financial system, proceedings of the Federal Reserve Bank of Kansas City Jackson Hole symposium, 2008. 15 See H S Shin, "How much should we read into shifts in long-dated yields? ", speech at the US Monetary Policy Forum, New York City, 3 March 2017. 16 For the Federal Reserve, see "FOMC statement on policy normalization principles and plans", 17 September 2014; and "Minutes of the Federal Open Market Committee", 17-18 March 2015. For the ECB, see M Draghi, "Monetary policy and the economic recovery in the euro area", speech at The ECB and Its Watchers XVIII Conference, Frankfurt, 6 April 2017; and B Cœuré, "Central bank communication in a low interest rate environment", speech at an event organised by Bruegel, Brussels, 31 March 2017. For the Bank of England, see "The MPC's asset purchases as Bank Rate rises", Inflation Report, November 2015. 17 See L Pereira da Silva and P Rungcharoenkitkul, "QE experiences and some lessons for monetary policy: defending the important role central banks have played", Eurofi High-Level Seminar, Malta, 5-7 April 2017; C Borio and A Zabai, "Unconventional monetary policies: a re- appraisal", in R Lastra and P Conti-Brown (eds), Research Handbook on Central Banking, Edward Elgar Publishing, 2017; and A Filardo and J Nakajima, "Cross-country macro evidence on the effectiveness of unconventional monetary policies in a low interest rate environment", BIS Working Papers, forthcoming. 18 See Q Chen, M Lombardi, A Ross and F Zhu, "Global impact of US and euro area unconventional monetary policies: a comparison", BIS Working Papers, no 610, February 2017; Q Chen, A Filardo, D He and F Zhu, "Financial crisis, US unconventional monetary policy and international spillovers", Journal of International Money and Finance, no 67, 2016; and B Hofmann and E Takáts, "International monetary spillovers", BIS Quarterly Review, September 2015. 19 See H S Shin, "The bank/capital markets nexus goes global", speech at the London School of Economics and Political Science, 15 November 2016. 20 See A Filardo and B Hofmann, "Forward guidance at the zero lower bound", BIS Quarterly Review, March 2014. 21 See the 85th Annual Report for a discussion of collective action problems in global monetary policy.